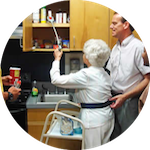 Occupational therapy services may include comprehensive evaluations of the client’s home recommendations for adaptive equipment and training in its use, and guidance and education for family members and caregivers. Occupational therapy practitioners have a holistic perspective, in which the focus is on adapting the environment to fit the person, and the person is an integral part of the therapy team. See more at: http://www.aota.org/about-occupational-therapy.aspx#sthash.EZAeABUs.dpuf The American Occupational Therapy Association http://www.aota.org/about-occupational-therapy.aspx An Occupational Therapist may recommend safety devices such as grab bars for areas in your home where extra support is needed, An occupational therapist will do a fall risk assessment and evaluate how you can safely move around in your home.